Presidential aspirant and two-term Maryland Gov. 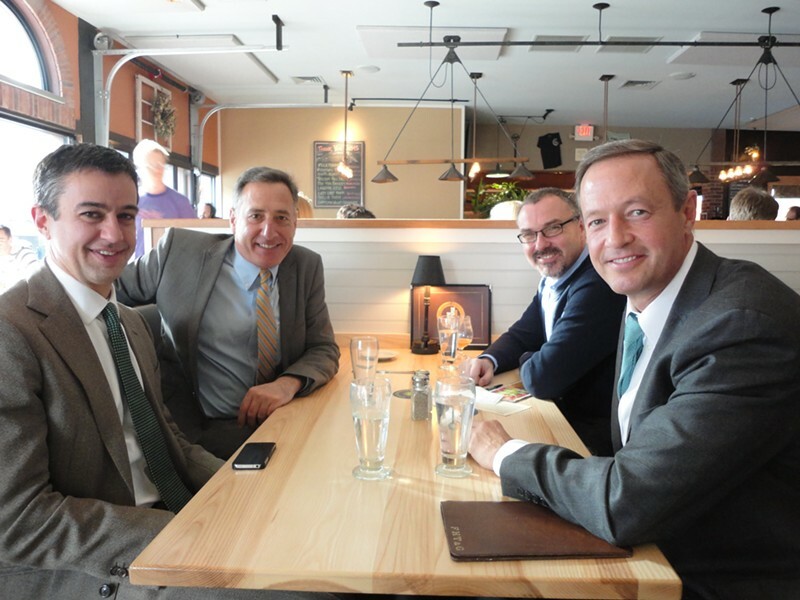 Martin O'Malley flew to Burlington Tuesday to meet with Vermont Gov. Peter Shumlin as the former prepares to hand off the chairmanship of the Democratic Governors Association to the latter. 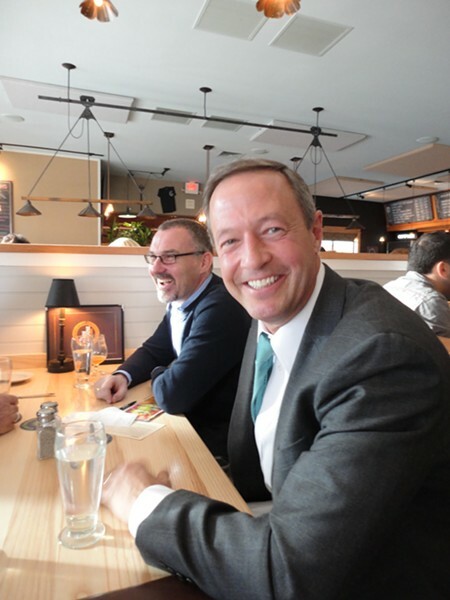 "I just wanted to meet with him in his element and pass the baton," O'Malley told Seven Days after polishing off lunch with his fellow gov. That would be Burlington's Farmhouse Tap and Grill, where the two dined with DGA executive director Colm O'Comartun and Shumlin chief of staff Bill Lofy, who is leaving state government to serve as Shumlin's liaison to the DGA. "I wanted to come up and see Gov. Peter Shumlin, who I anticipate and hope will be the next chair of the Democratic Governors Association," O'Malley said. "He's become a dear friend to me and I have a great deal of respect for how he governs and his leadership abilities. And so I just wanted to come up here and sit down and talk about the transition forward after what was a really good year." With 11 gubernatorial races on the ballot two weeks ago, the DGA was successful in defending seven of eight seats held by Democrats, losing only North Carolina. The DC-based organization helped Democratic candidates win three particularly close races: in Montana, Washington and New Hampshire. Shumlin hasn't officially been elected to chair the DGA. That's expected to happen during the organization's winter meeting in Los Angeles in two weeks. But O'Malley indicated it's a done deal. "I think Gov. Shumlin's gonna do great," O'Malley said. "His fellow governors believe he's a person who can speak clearly from the perspective of all of the Democratic governors and also stay on that most important of all issue, which is jobs and opportunity." Asked what advice he has for his successor, O'Malley said, "Any effective governor knows you have to surround yourself with good people and you have to make every decision on what's best for the overall mission. And I think that's why the DGA's been successful. We've had a very good political staff, fundraising staff. You know, we fight to win." Frequently cited as a top presidential prospect in 2016, O'Malley traveled widely to swing states during the fall campaign season — visiting early primary states like Iowa and New Hampshire — and locked down a prime-time speaking slot at the Democratic National Convention in Charlotte. On Tuesday he postponed a long-planned trip to Israel scheduled for next week, which The Jewish Week called the "first stop" on his road to the White House. But when Seven Days tried to pin him down on his presidential aspirations, O'Malley coyly pretended we'd asked about Shumlin's presidential plans. "Pete?" he said, looking across the table at Shumlin. "I don't know? I think this is a year of discernment for Pete." "We haven't had one since Calvin Coolidge," Shumlin said. "If you do run for president, you'll come to Vermont to announce it, I assume, this being a very essential swing state?" we asked O'Malley. "I already got that promise out of him," Shumlin said. "I've extracted that promise." Added O'Malley, "I love Vermont. Y'all have a really pretty state. I remember as a boy always reading about the Green Mountain Boys and Ethan Allen. Right?"